The genesis of Quartz for ASP.NET was what I felt were some Problems with ASP.NET MVC Framework Design. Quartz for ASP.NET can be used in conjunction with ASP.NET MVC or in regular ASP.NET WebApplication/Website projects (without any WebForms). It works the same either way. There are a few Videos in the Videos section below, that you may want to watch. However, the primary driver for Quartz for ASP.NET was the way in which you build pages in ASP.NET MVC and the problems with that design. 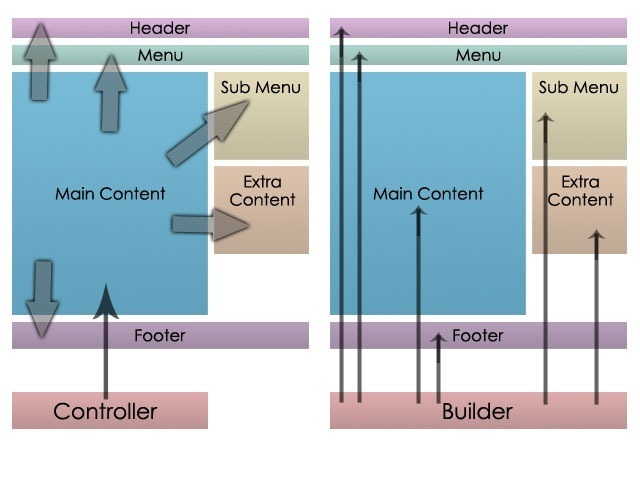 Figure 1 below, shows the relationship and flow of control in the ASP.NET MVC design, between a Controller and a View, Partial View and Master Page/Layout Page. 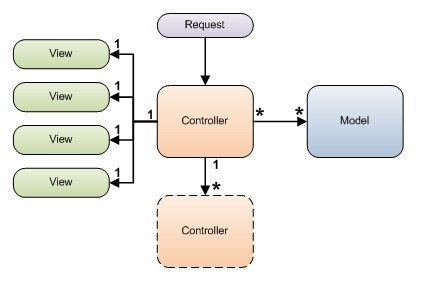 Figure 1: ASP.NET MVC - relationship between a Controller and "views"
You'll notice that the process of building a page is akin to a chain reaction. That wouldn't be so bad if it weren't for the fact that the controller is not really controlling anything besides starting off a specific chain reaction (everything to the left of the Controller on the right in Figure1). 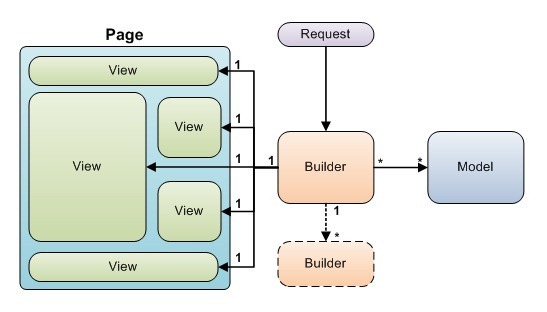 Figure 2 shows the relationship and flow of control between the Builder and the Views and Master Page Template. The Builder picks a Master Template (an Html file). This template usually has spots that need to be filled in, as shown in Figure 2 above, the "Page"
Since the Builder has access to instances of each of the views enlisted to render the page, it can talk directly to these views to hand them the data each of them will need to do their part. Once it has done the above, each of the views go off and do their part (generate html) and a page is produced. Use any other mechanism to generate html, such as T4 Templates. The code listing below is a sample of the code you'd write in a Builder's BuildPage() method. Traditionally, web application frameworks work in a inside-out fashion. That is, when you field a request for a page, you’re really starting with the inner most part of the page and working your way out (by calling RenderAction or RenderPartial in MVC parlance). 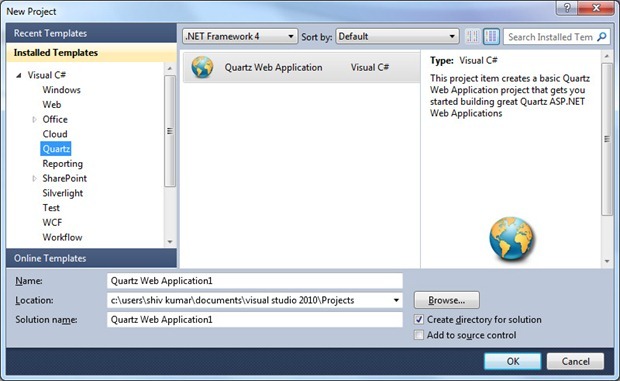 In Quartz for ASP.NET you start with a template and compose your page using multiple views. It’s really a lot more intuitive to think and work this way, than inside-out. Views are completely unaware of the Builder that enlisted them or any other Builders for that matter. 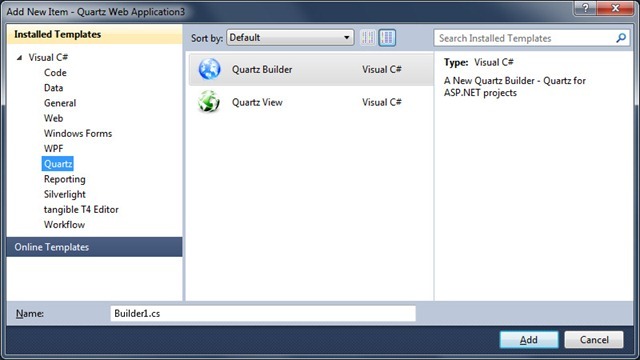 In Quartz for ASP.NET, Views are the "leaf nodes". There is only one loosely coupled linkage, that between the Builder and the views it enlists. All the code you write is strongly typed so you get all the benefits of strong typing and the IDE can help you navigate your classes and methods (F12). In the video below I attempt to give you a really good overview of what the Quartz framework is and how you would use it. So please take a look at the video since not only will you get a really good sense of what Quartz for ASP.NET is but I'm sure a lot of your questions will be answered as well. This is a short video that shows you how data binding works. We use the Repeater in this demo as well so you'll also get to see how the Repeater can be used along with templates. 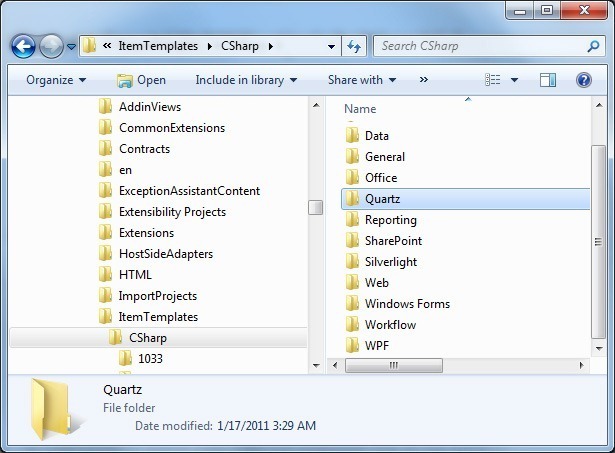 Extract the files from the downloaded zip file to a temporary folder. First we'll installed the Project Item Template. Follow the steps listed in the Rebuilding the Visual Studio Cache section below in order to rebuild the VS.NET cache. Start Visual Studio (rebuild the cache first!) and create a new project. The steps involved in installing the Item Templates in Visual Studio are similar to the steps we followed earlier for installing the Project Item Template. This time you need to create a folder under a different hive. 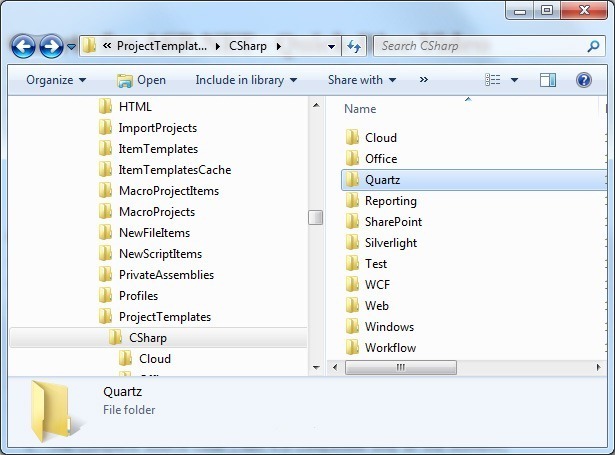 Like before, create a folder called Quartz under this folder as shown in Figure 6 below. Rebuild the Visual Studio cache again using the steps listed in the Rebuilding the Visual Studio Cache section below. A shorter introductory video would be nice. I just read, watched 1 minute and went to download the source. Most people dont really have 1 hour. Can you provide source of this actually being in use? I only see source of the project and VS.NET templates. Is this fully compatible with ASP.NET MVC? That is, will I still use controllers and routes? Is the Builder in addition to views, or does it replace views? So the routing and other things will be that of the MVC project/framework. If you use Builder for ASP.NET on it’s own, then things are obviously different. PS: Take a look at the DataBinding video, it shows binding a "form" and generating the page, so it should be fairly short. Shawn, I'm made and uploaded a shorter video that talks about data binding. It's not an intro kind of video so a lot of things may not be very clear. The demo app (the one that's shown in the video) will be made available soon. It’s just that it uses a database so I need to make it such that there is no database. That'll will make it a lot easier for people to play with the demo app. Does Builder run on Mono? At the moment, I’m afraid not, since the framework depends on one of the classes that was introduced in .NET 4.0 (ConcurrentDictionary primarily).